Face it. The best meal you can get at McDonald's is breakfast. And for a limited time, you can get just that at a McDonald's in Tokyo. That's all you can get. Wahoo! The McDonald's in Tokyo's Shinjuku (the Meiji-dori Sutepa-ten, to be exact!) has put its regular menu on hold and is serving round the clock breakfast. 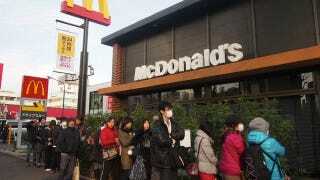 In Japan, the McDonald's breakfast service is called "Asa Makku" (朝マック) or "Morning McDonald's". Website IT Media recently swung by to check out the fast food festivities. The campaign is the latest in a string of ones from McDonald's Japan that has unintentionally resulted in french fry madness and hamburger horrors. This latest stunt seems like it won't end in fast food chaos. If you live in the greater Tokyo area, you have until January 20 to enjoy the round the clock McDonald's breakfast in Shinjuku. Or the giant Sausage McMuffin on top the restaurant.